So What’s the Big Deal for Salespeople? Women make 85% of all household decisions, yet salesmen have never been trained how to uniquely sell to them. Men control over 80% of Business to Business purchasing, yet women have never been trained how to tailor their communication skills for maximum effectiveness. 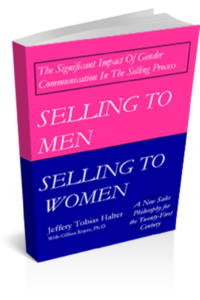 SELLING TO MEN, SELLING TO WOMEN is the first book ever written by a Professional Sales-MAN that examines the significant issue of gender differences in the selling process. Jeffery has over 30 years of experience in sales, sales training and diversity education. This unique mix of sales training and diversity championing make him uniquely qualified to handle this challenging topic. “The most significant variable in every sales situation is the gender of the buyer, more importantly, how the sales person communicates to the buyer’s gender. It is now a validated and documented fact that men and women communicate differently, very differently. Everything from eye contact, to body language, to the usage of language and the processing of information is different in men and women.